The Clinique Vétérinaire Plateau Mont-Royal is proud to support the work of Montréal’s rescue organizations. We also strongly encourage people looking for a new family member to consider adoption. We are proud to partner with a number of local rescues and also provide a temporary home for cats. While we are not a rescue, we do run a very small cat adoption program. Since its formal inception in 2010, our rescue program has helped find permanent homes for over 60 cats and a handful of dogs. 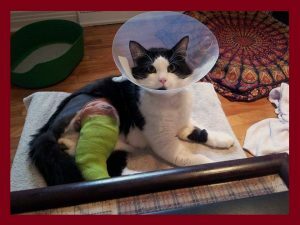 In October 2018 an adorable 2-year-old male cat was presented to our clinic by his owner for sudden limping. 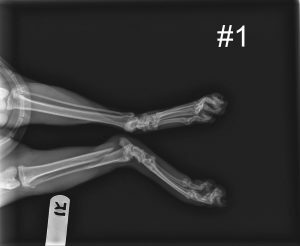 After taking x-rays we, unfortunately, diagnosed a right tibia fracture as you can see on X-ray # 1. 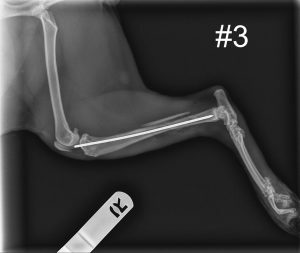 This kind of fracture can take a long time to heal and requires a lot of care and his owner was not able to give him all he needed for his convalescence. Together, we decided to take him under our wing in our adoption program and try to save his leg and give him a new life with us in the clinic. 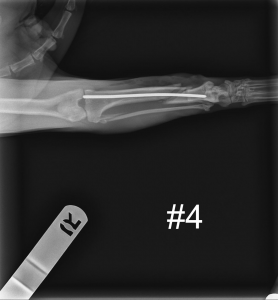 So we put a bandage as you can see on X-ray # 2 before going to surgery to place an orthopedic pin. 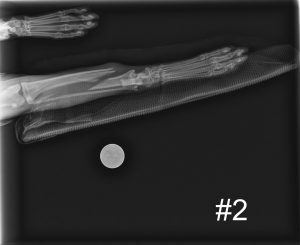 The pin, that you can see on X-ray #3 and #4, will remain in place for a certain time in order to allow the bone to heal correctly, then we will remove it. Once he is recovered we will start to accept adoption applications for him.